Overview: SCL is a 70 year old firm that delivers books, content and services in education to the K-12, higher education and early learning segments with strong presence in CBSE/ICSE schools. SCL revenues, EBITDA and PAT have grown at 32.6%, 47.5% and 33.9% CAGR from FY12 to FY16. SCL had a strong distribution and sales network across India. SCL has good relationships with authors who create and refine content. Textbook quality is excellent. The recent M&A strategy has given them a strong position across subjects, central and state boards and multiple languages. SCL is a thought and execution leader in this space with good content through authors and reach through distribution networks. It is capturing innovation by buying good education firms to enhance offerings. The IPO will help reduce debt even as operational revenues grow at 32.6% CAGR. Key risks: 1) At a PE of 36.8 TTM, the valuations are expensive. 2) SCL has a seasonal business 3) NCERT provides subsidized textbooks and may prevent usage of SCL textbooks. Opinion: This IPO offering is rated BUY, and investors can invest with a 2 year perspective. Here is a note on S Chand and Company Ltd. (SCL) IPO. The IPO opens: 26-28th Apr 2017 with the Price band: Rs. 660-670 per share. Shares offered to public number 1.08 cr. The FV of each is Rs. 5 and market Lot is 22. The IPO in total will collect Rs 729 cr. while selling 31.34% of equity. Of this, SCL will raise Rs. 325 cr. by issuing fresh shares and the selling shareholders will receive Rs. 404 cr. at the UMP. The promoter group owns 58.33% in SCL which will fall to 46.7% post-IPO. The IPO share quotas for QIB, NIB and retail are in ratio of 50:15:35. This is good for Retail. IFC holds 9.4% stake in SCL (Pre-IPO) and Everstone Capital Partners holds 32.3% (Pre-IPO). IFC will remain invested, while Everstone is selling half of its current stake in SCL. The unofficial/ grey market premium for this IPO is in the range of Rs. 160. This is a positive. The first day of IPO saw that it is already 52% subscribed, so it looks like it will sail through very successfully. SCL is a 70 year old firm that delivers books, content and services in education to the K-12, higher education and early learning segments and has a strong presence in CBSE/ICSE affiliated schools. Revenues for FY16 were Rs. 541 cr. and profit Rs. 47 cr. It has 2,135 full time employees (Dec ‘16. ), whereas Chhaya has 309 employees (Dec ‘16.). In Dec2016, SCL bought a 74% stake in Kolkata-based publisher Chhaya Prakashani Pvt. Ltd for Rs. 170 cr. SCL will acquire remaining 26% by Nov2018. In the past S Chand acquired Delhi-based publishers New Saraswati House in 2014 and Vikas Publishing House in 2012. SCL has 55 consumer brands across knowledge products and services including S. Chand, Vikas, Madhubun, Saraswati, Destination Success and Ignitor. It recently acquired 74% of Chhaya Prakashani Pvt. Ltd. and now also offers 4 Chhaya brands including Chhaya and IPP. SCL has a contractual relationship with 1,958 authors (including co-authors) for over 5 years. Additionally, Chhaya has contractual relationships with at 24 authors. SCL had a sales and distribution network of 42 warehouses in 19 states, 4,932 distributors and dealers, and a sales team of 838 working from 52 branches and marketing offices. Chhaya Acquisition has expanded presence in East India to add 771 distributors and dealers. SCL has developed a robust supply chain. In FY16, 85% of printing requirements were met by facilities in Sahibabad and Rudrapur. The paper purchases are integrated, which lowers costs. About 72.5% of SCL’s sales are derived from the K-12 segment (KG to 1st to 12th grade). And 75% of sales of SCL are generated in the 4th quarter every year, at the start of the new academic year. Fig 2. Leadership is Desh Raj Dogra (Chairman), Himanshu Gupta (MD), and Saurabh Mittal (CFO). In FY11, SCL’s key subjects were English grammar, Math and Science. It has since made many acquisitions. In 2013, SCL acquired Madhubun and Vikas – to improve its Hindi language titles. In FY15, it acquired Saraswati brand to strength its French, languages, arts and crafts titles. SCL has 12 subsidiaries including Chhaya Prakashini. But 7 of these 12 have incurred losses in FY16. In FY16, SCL sold 3.55 crore copies of 11,144 titles. Additionally, Chhaya sold 98.8 lakh copies of 433 titles. SCL’s top 10 best-selling titles accounted for sales of 29.6 lakh copies in FY16, and 15 of their authors had each sold over 10 lakh copies of their titles during the last 5 years. On the website, schandpublishing.com the firm offers ecommerce services. SCL is looking to acquire firms in the higher education business, particularly in the test prep market. It plans to do so to increase its market share in the State Board segment in attractive markets. SCL invested in online test prep startup Testbook in Mar2016. It is an online test prep platform for competitive exams such as GATE, CAT, SBI PO and IBPS PO, besides others. The platform allows students to simulate an environment similar to the actual examination. SCL invested Delhi-based Smartivity Labs Pvt Ltd, an online venture that deploys augmented reality and robotics for kids learning projects in Oct 2015. A recent survey by market research agency Nielsen revealed that India’s book publishing market is the sixth-largest in the world at Rs 26,100 crore, and is likely to touch Rs 73,900 crore by 2020. The formal education segment comprises both K-12 schools (including secondary and senior secondary schools) and higher education institutions (colleges, higher education institutes). Whether government or privately owned, this segment is governed by the ‘not for profit’ diktat, meaning that such educational institutions in India cannot be operating on a ‘for profit’ basis. The informal segment comprises test preparation, tutoring, early education and vocational/skill-based training segments. The informal segment does not have restrictions on operating on a ‘for profit’ basis and does not have restrictions on profit distribution. The formal, informal and ancillary segments are collectively estimated at US $90 billion as of 2015 and expected to reach US $188 billion by 2020. India has a large population in the education age bracket of students aged 5-24, which stood at 52 crores in 2016. This may grow to approximately 53.4 crores by 2020. In addition to the growing population, a reduction in drop-out rates is expected to contribute to increase in market size. The K-12 education system in India is one of the largest in the world, with a market size of US $49.5 billion, comprising 11 lakh govt. schools and 4 lakh private schools. Schools have grown from 13.6 lakh (FY11) to 15.2 lakh in (FY15). During 2011-2014, the share of private unaided schools recorded the highest growth rate among other types of schools from 14.2% to 19%. Most schools in India are affiliated to 1 of 3 main governing bodies for K-12 schools: (a) state level SSC education board; the Central Boards of (b) CBSE; and (c) ICSE. CBSE schools have grown at the fastest CAGR of 8.9% during 2011-2015. SCL is a market leader with a share of 13% in education content. The closest peers are Oxford Publication and Orient Black Swan have a share of 6% each. (source – newspaper reports). 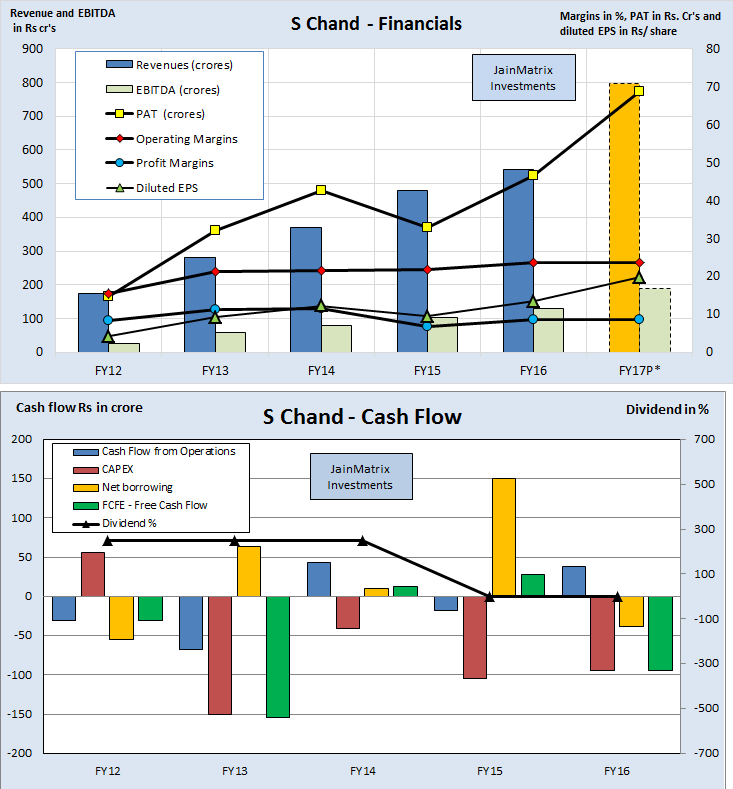 SCL’s revenues, EBITDA and PAT grew at 32.6%, 47.5% and 33.9% CAGR in 5 years, see Fig 3. FY17 revenues is a projection of 9M FY17 financials, assuming 75% comes in Q4; and adding financials of Chhaya Prakashini. Thus revenue and PAT growth are good. The EPS has risen sharply in 5 years. This is excellent. But there was a fall in FY15. Here SCL witnessed a disruption due to Chennai floods; it also acquired 51% in New Saraswati House. SCL has negative cash from operations and FCF in 3 of last 5 years, Fig 4. This is a negative. However this is explained by the vigorous M&A activity as SCL has grown inorganically. SCL has not declared dividend in the last 2 years, however it hadan interim dividend for FY17. SCL has an ROE of 7.8% in FY16 which is low. Operating margins have been flat while profit margins have fallen a little. However with acquisition of Chhaya Prakashini, the margins should improve, it had a net profit margin of 12.4% (Dec 2016). SCL has a cash balance of Rs. 24.4 cr. today which translates into Rs. 7.03 as cash/share which is low. We benchmark SCL against peers from education /publishing sector. However the main comparison is with Navneet due to Repro (losses), MPS (technology), CLE (classroom) and others (newspaper publishing). Note that Navneet too has a significant stationary business. See Fig 5. PE for SCL appears expensive at an FY17P* of 36.8 as compared to Navneet at 25.2 times with better financials. The valuation of SCL is moderate in terms of P/B ratio. SCL has witnessed high sales growth in the last few years. The EBITDA margins are good, while profit margins have dragged. The 3 year PAT growth is moderate at 13.4%. The D/E ratio at 0.82 is moderate, however the highest in the industry. The return ratios are poor. This is a negative. The SCL numbers are consistent with a firm on a growth and acquisition spree that is well on the way to becoming a textbooks and education content leader. In 2-3 years the benefits of this will accrue to shareholders. The IPO is beneficial to SCL. The fresh issue proceeds will retire some of the debt and improve financials. SCL has strong brand equity with high consumer recall. The IPO and post listing visibility will enhance the brand of SCL as a consumer product. SCL has in the last 4 years followed a coherent M&A strategy – first to expand subjects under coverage, then including state boards, regional languages and education innovation tech firms. SCL is a comprehensive consumer education content player across the education lifecycle. A strong presence in the CBSE/ICSE schools and increasing presence in state board schools. SCL has strong integrated in-house printing and logistic capabilities. In FY16 over 85% of their printing requirements were met by their facilities located in Sahibabad and Rudrapur. SCL has a pan-India sales and distribution network driving deep market reach. SCL has a highly seasonal business of their main K-12 business segment with 75% of their sales generated in Q4 every year. This also means seasonality in working capital. The valuations look expensive in terms of P/E ratio. Debt is high, with ok margins and low RoE. SCL operates in a highly-competitive and fragmented industry. Many of the content providers have strong brand recognition in local markets and long term relationships with schools, school authorities and educational authorities. They also face competition from the govt. National Council of Educational Research and Training (NCERT) and the State Council of Educational Research and Training (SCERT), which publish books for the K-12 market at subsidized costs. For the past 2 years, CBSE board has issued an advisory circular advising CBSE affiliated schools to use only NCERT books for all classes. CBSE issued the circulars in response to reports and complaints from parents that schools were asking them to buy books published by private companies. The CBSE books are much cheaper (subsidy) but there is a big difference in quality and content of these. A large portion of SCL revenues are derived from titles of their top authors. In FY16, their top 20 authors contributed to 48.9% of revenues. The loss of such authors could adversely affect business. SCL has an obligation to acquire the remaining 26% of share capital of Chhaya Prakashani by Nov 2018 which may need to be financed with additional debt. SCL may be impacted by the introduction of the GST. However it is likely that after making the operational alignment changes, it may be beneficial for business and ease distribution and pricing. The presence of 55 consumer brands sounds daunting. It may be a legacy of M&A. It may be necessary for SCL to simplify branding by merging many and focusing on 5-10 key brands. M&A are often risky and SCL needs to ensure success of all acquisitions, and suitable synergy gains. India has a very young population that is underpenetrated in terms of education. A lot of govt. focus is already on improving availability and outcomes in K-12 education. Education content continues to be an important aspect of K12 education with textbooks, guides and question papers being key elements. SCL is a thought and execution leader in this space with good content through authors and reach through distribution networks. It is also aggressively growing across subjects and languages, from central to state boards, and from paper to online distribution. It is capturing innovation by buying good education firms to enhance offerings. At a PE of 36.8 TTM, the valuations are expensive. However we feel that debt can be reduced post IPO even as operational revenues gallop forward at 32.6% CAGR. This document has been prepared by JainMatrix Investments Bangalore (JM), and is meant for use by the recipient only as information and is not for circulation. This document is not to be reported or copied or made available to others without prior permission of JM. It should not be considered or taken as an offer to sell or a solicitation to buy or sell any security. The information contained in this report has been obtained from sources that are considered to be reliable. However, JM has not independently verified the accuracy or completeness of the same. Punit Jain intends to apply for this IPO in the Retail category. Other than this, JM has no known financial interests in SCL or any group company. Neither JM nor any of its affiliates, its directors or its employees accepts any responsibility of whatsoever nature for the information, statements and opinion given, made available or expressed herein or for any omission therein. Recipients of this report should be aware that past performance is not necessarily a guide to future performance and value of investments can go down as well. The suitability or otherwise of any investments will depend upon the recipient’s particular circumstances and, in case of doubt, advice should be sought from an Investment Advisor. Punit Jain is a registered Research Analyst under SEBI (Research Analysts) Regulations, 2014. JM has been publishing equity research reports since Nov 2012. Any questions should be directed to the director of JainMatrix Investments at punit.jain@jainmatrix.com.